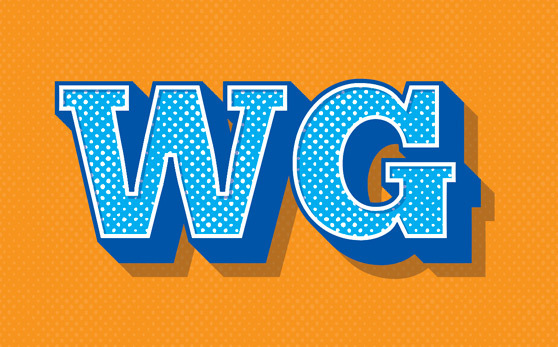 Everyone loves retro type styles. Whether its a poster heading or an editorial title, this style is very desirable. 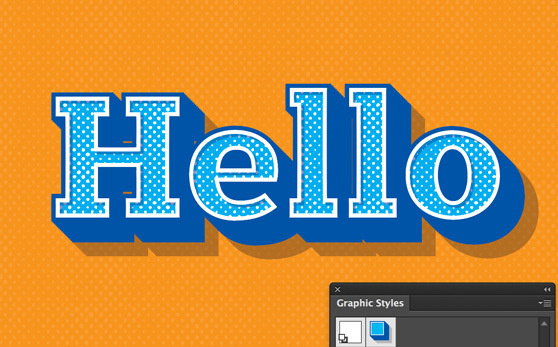 Creating type effects in Adobe Illustrator via the Appearance panel is quick and easy. Keeping your type editable and saving your effects via the Graphic Styles presets is a huge time savor for down the road. I?ll show you how to do both in the tutorial below. Let?s dive right in! 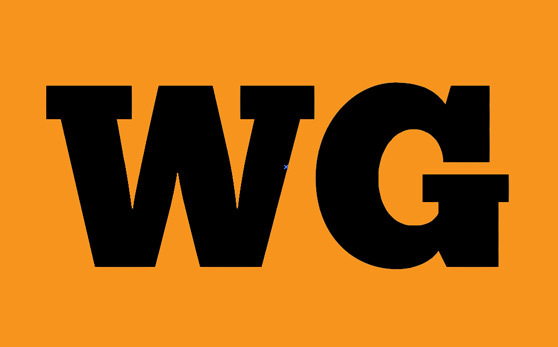 For the font I wanted a thick slab serif that would lend to the retro look. I chose Chunk Five which is available as a free download here. 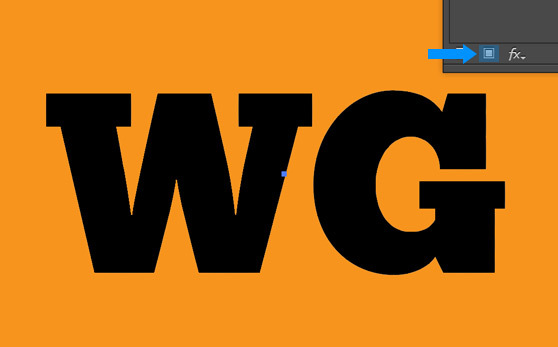 In a new Illustrator document I typed ?WG? in a font size of 160px. 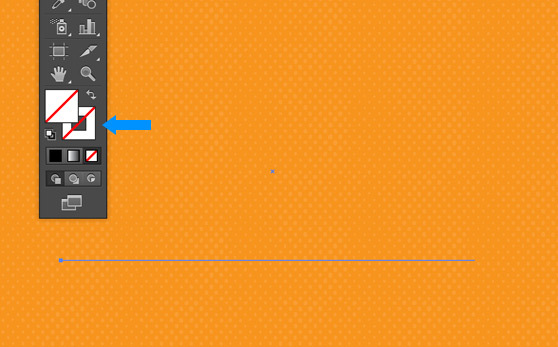 Now create a large orange rectangle for the background using the Rectangle Tool (M). Send it to the background below the type by clicking Object | Arrange | Send to Back. I used a distressed halftone pattern as a background texture. I won?t go into depth on how to create a pattern like this for this tutorial. So you can create your own pattern, or you can download the one I created here. Click and drag your pattern to the Swatches panel to create a new pattern swatch. If you don?t see the Swatches panel click Window | Swatches. Open the Appearance panel by clicking Window | Appearance. 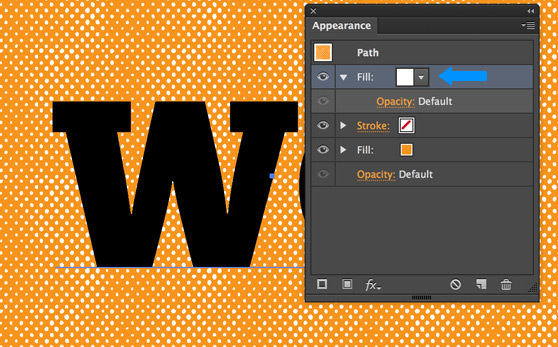 Now select the orange background and click the New Fill button in the bottom left of the Appearance panel. Click the drop down next to the new fill and choose the newly created pattern swatch for the fill. 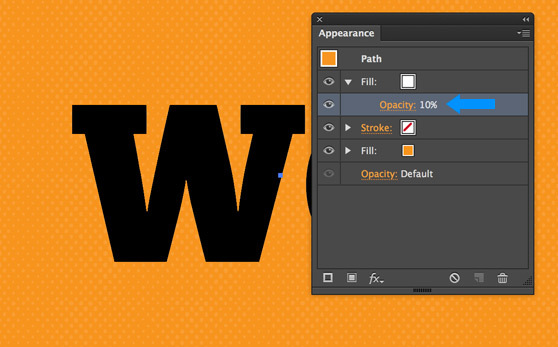 In the Appearance panel, click the Opacity link and change the texture?s opacity to 10%. Now we?re going to do essentially the something for the type. 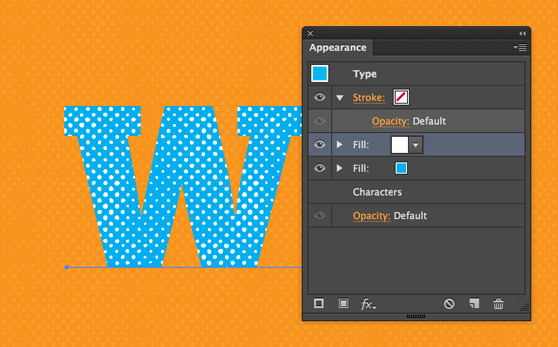 Select the type and remove any fills or strokes using the Tools panel. With the type selected go back to the Appearance panel and add a new fill. Choose a light blue color from the swatches drop down. Now create another fill and place it above the light blue one. Select the dot pattern we used for the background. Now we?ll add some strokes. 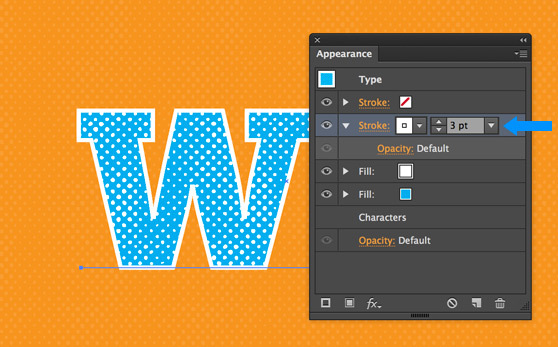 With the type selected click the new stroke button in the bottom left of the Appearances panel. Choose white for the color and 3pt for the stroke width. We need to add a couple of effects to this stroke. With the stroke selected, click the little ?FX? icon at the bottom of the Appearances panel. 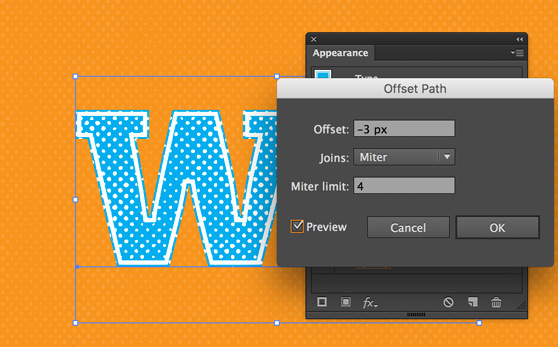 Choose Path | Offset Path and enter a value of -3. 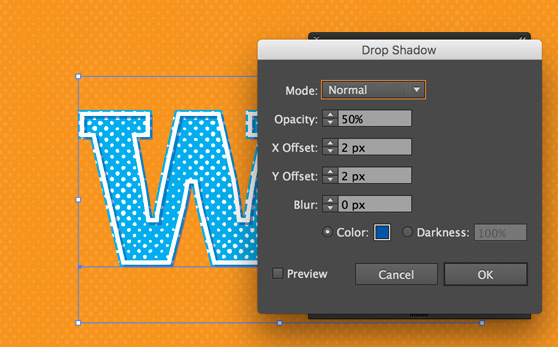 Now click the FX button again and choose Stylize | Drop Shadow. Enter the settings that I used in the screenshot below. Add one more stroke with a width of 3pt. Choose a dark blue from the swatches panel for this one. That?s it for the strokes! Now let?s complete the retro effect with a 3D treatment and drop shadow. 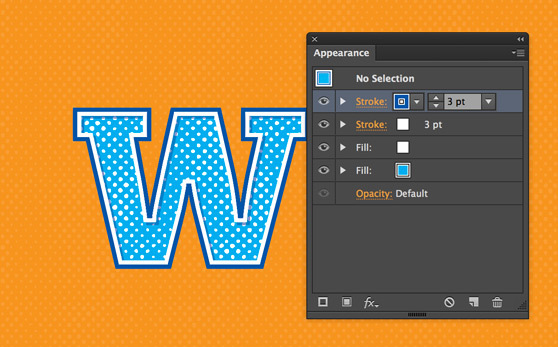 With the type selected, go the the Appearance menu and add another fill. Use the same dark blue that you chose for the last stroke. Make sure this dark blue fill is below all others. You won?t see any change made to the type just yet. 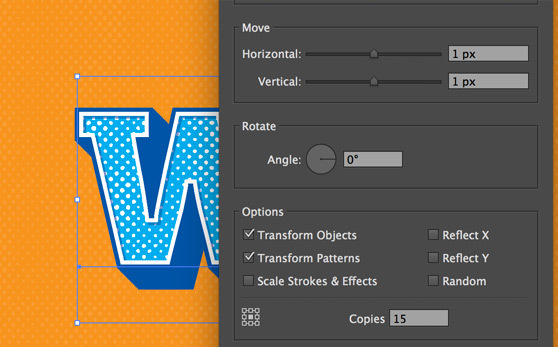 Now add a Transform effect by clicking the FX icon again and choosing Distort and Transform | Transform. Enter 1px for both horizontal and vertical move, and enter 15 for copies. 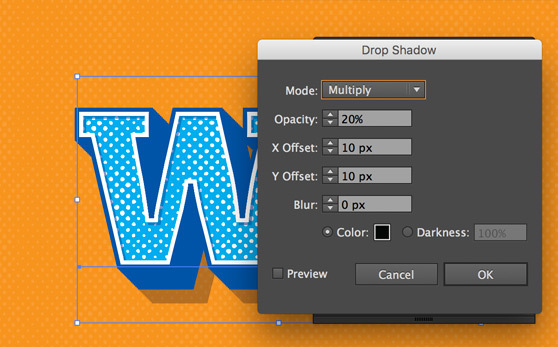 For the shadow, click the FX icon again and choose Stylize | Drop Shadow. Enter the settings that I have in the screenshot below. The best part about this effect is that the type remains editable. 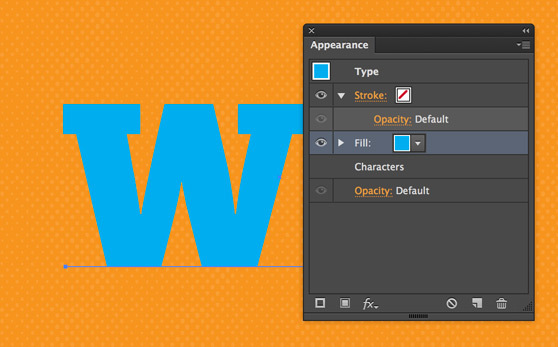 To reuse the effect, simply open the Graphic Styles panel by clicking Window | Graphic Styles. 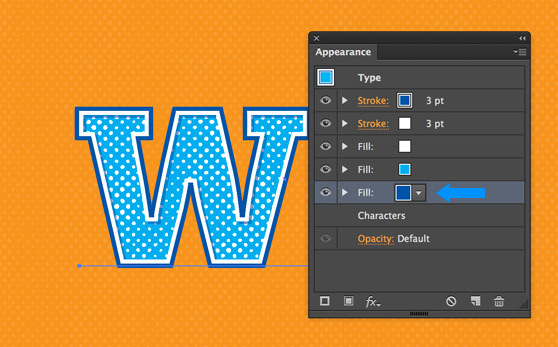 Select the type and drag and drop it onto the Graphic Styles panel. Now you can type new text and select the style to apply it!